What Phone & SMS Triggers and Actions are Supported? Send SMS - Send an SMS to a number. Notice that a successful action means that the SMS has been queued, not delivered. One really fun and useful way to get notifications is via SMS! 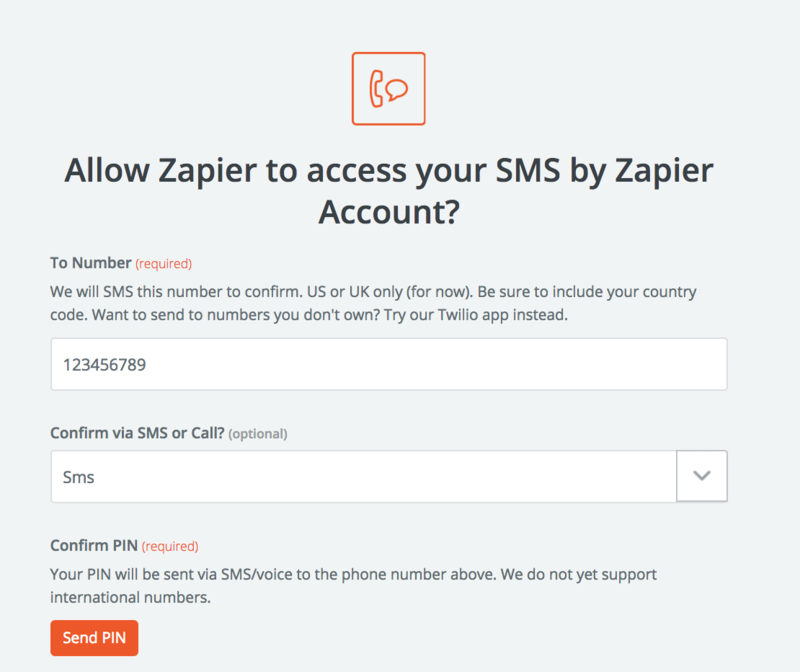 Zapier has a free built-in service which allows you to send SMS as an Action for any Zap. International support is limited to US and UK right now. For full international support, we recommend setting up your own Twilio Account and using our dedicated Twilio service. 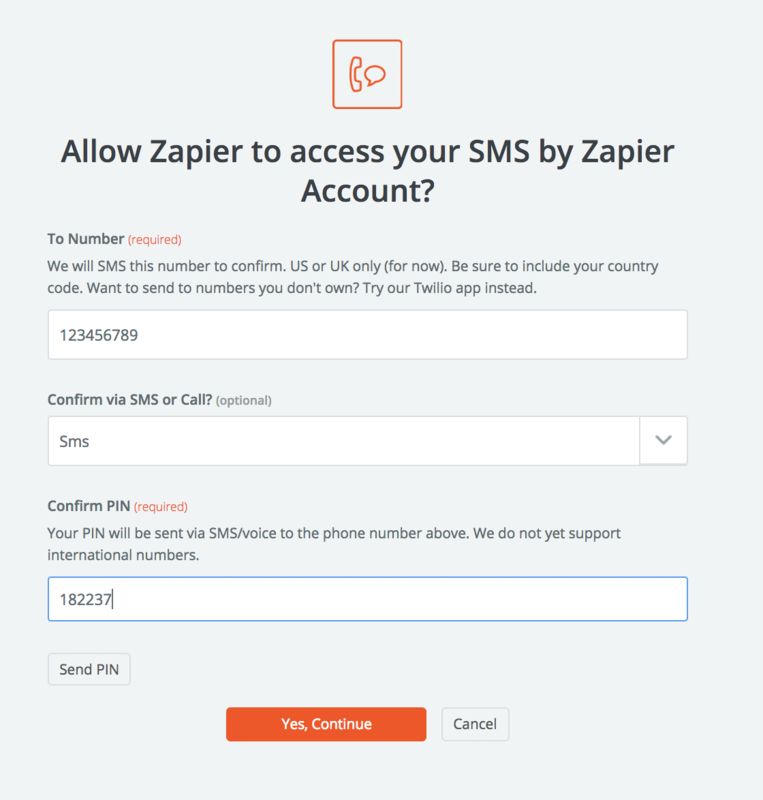 After you've chosen the SMS action, you'll be prompted to authorize your own phone number with Zapier. This number is the one the Zap will actually send to when the Zap is triggered. You can send to multiple phone numbers by setting up and verifying multiple Phone Number Accounts. Note: Only US and UK numbers are supported. For full international support, we recommend setting up your own Twilio Account and using our dedicated Twilio service. To get started, click to connect a new account. Next type in your phone number (no spaces or punctuation please!) and choose whether to receive the confirmation PIN as an SMS. Note: If you are using a US number, you can provide your 10-digit number. If you are using a UK number, include your country code! Click the "Send PIN" button, then wait for your PIN to be delivered! You'll get an "error" feedback if the number is invalid or some other error occurred. With the PIN in hand, type it into the blank box that is created. And finally, click "Continue" to finish verifying your phone number and receive a test SMS! This means the phone number you typed in is invalid. It may be an international number (outside of US or UK) or you might have left punctuation or you didn't include a country code with a UK phone number. Remove all punctuation -- just the digits please! Include a country code for UK numbers. For other international numbers, check out our Twilio service. Text messages are limited to a maximum of 153 characters and Zapier will cut off any more characters than that. If you'd like to have your message split into multiple messages if it's longer than 160 characters, check out our Twilio service which does just that. Zapier's in-house SMS/Call is provided free of charge, so we rate-limit Actions to 15 SMS per hour to avoid abuse. If you need more than this, please check out our Twilio service. If you're in the UK, unfortunately we'll override the number that your text message comes from with a UK number.